After the January 15 1966 failed coup lead by Major Chukwuma Kaduna Nzeogwu, and the circumstantial lead to the elevation of Major General Aguiyi Ironsi to power as the military head of state. There was unrest in the northern part of Nigeria as the northerners were aggrieved because they were deceived and aggravated into believing that the coup which led to the death of some top Nigerian first republic leaders was planned and carried out by only the Igbo officers in the army. Whereas this was a lie from the pit of hell as the coup was planned by aggrieved young officers including those of other origins in Nigeria. The hatred the Hausa/Fulani people had for the Igbos resulted in a counter-coup where Aguiyi Ironsi and other Igbo soldiers were specifically targeted and murdered. Even the Igbo civilians were not spared as children, women, men and youths were hunted down and hacked to their death. The massacre was hugely supported by the government in power.The whole borders of the north were blocked to ensure that no single Igbo person escape from the massacre. A particular incident that has remained in the mind of every right thinking Igbo man occurred at the emir's palace in Katsina state. When the man hunt became worst, most Igbos ran away from their homes to seek refuge in the palace of the then Emir of Katsina, Emir Hassan Katsina. On that day most of the Igbos who were seeking for refuge in the Emir's palace were all gathered together and sheltered but to be used later as sacrificial lambs as they were all slaughtered. 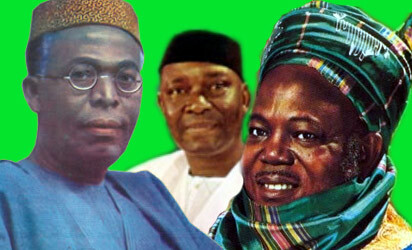 Before the gruesome death of those innocent Igbos who were refuge seekers, there were already rumours about the massacre and that propelled the then military governor of the eastern region,Major Odumegwu Ojukwu, to seek assistance from Yakubu Gowon, then military Head of State, for the protection of the Igbo people in Katsina, Gowon assured Ojukwu that everything was under control but that was a lie. Igbos seeking refuge in the palace were massacred in a scene never known to humanity. One by one the Igbo people where sheltered in the Emir's palace were dragged out with hands and feet tied, an unsharpened knife was used on purpose in cutting the neck to ensure a slow and painful death. Goats do not receive such wicked treatment during slaughter neither does a chicken .Tired and in pain, the victims gave up the ghost while asking for water in the Igbo language "Nyem mu Mmri" literally expressing "give me water". Families watch as they each give up the ghost. Ever since then, the Hausa/Fulani people have adulterated the expression into "nyamiri" as a form of mockery to the Igbos. The Hausa/Fulani fuedal value system makes their people to see the Igbo people as "infidels" as taught from their Islamic belief. Igbos are slaughtered like animals at any slight provocation against Prophet Mohammed or the Koran. The case of Bridget from Imo State, the wife of the Deeper Life Pastor is still fresh in our minds as all those who hacked her to death have been acquitted by the law court in Kano. The Igbos are not even protected by long term neighbors in the north during a fracas, always feeling the brunt of betrayal in Nigeria. To those elders,senators,governors of eastern Nigeria who have remained silent and have continued to lobby with the federal government for their private interests instead of seeking the interest of their people; the blood of all those killed before,during and after the war is upon your head. These selfish men feel they hold the mandate and cannot be questioned. The People of old eastern Nigeria wishes to exercise their rights to self-determination as Indigenous People of Biafra. It is mandatory that those representatives in Abuja should never forget that. Those who call the Igbo people "Nyamiri" must understand that the forceful unity in Nigeria has expired and there is an outcry for freedom.